Marc Antony de Dominis arrived in England from Croatia in 1616, having abandoned a successful career in the Roman Catholic Church where he had been a bishop and, from 1602, Archbishop of Split. However, de Dominis had disliked the interference of the papal court in his affairs as archbishop and had openly sided with Venice and the Doge in its disputes with Rome over who should control the Venetian. 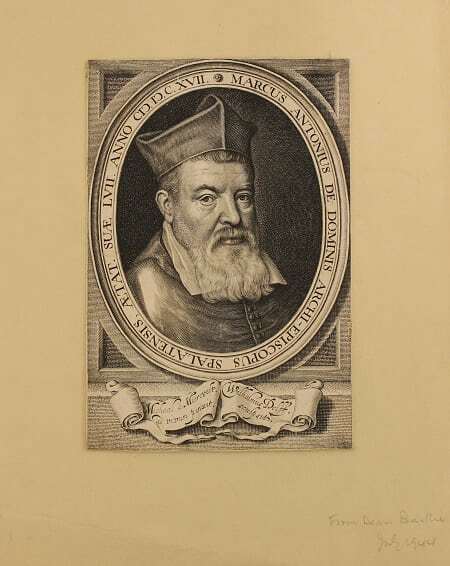 Repeated conflicts with his fellow bishops and clergy led de Dominis to resign his archbishopric in 1616. That same year he came to the attention of the Inquisition – the institution set up by the Catholic Church to investigate and suppress heresy – because he had developed a model for the governance of the universal church that would have decreased papal authority and encouraged re-unification of the Catholic and Protestant churches. To escape the Inquisition, de Dominis used his friendship with Sir Henry Wootton, the English ambassador to Venice, to seek refuge in England. He renounced the Catholic Church and published De Republica Ecclesiastica, which explained his model for the Church, as well as a number of violent attacks against Rome, both in writing and in his sermons. His contributions to the religious and political debates of the time gained him a high profile and his anti-papal attitude made him attractive to the English court. De Dominis is said to have flattered King James I excessively in order to gain preferment within the Church of England. The king granted him precedence over all bishops except the archbishops of Canterbury and York and encouraged his other bishops to pay de Dominis’s pension. In 1618 the king appointed him Dean of Windsor and Master of the Savoy Hospital in London, both positions of considerable prestige. Nevertheless, de Dominis remained widely unpopular and contemporary accounts describe him as irascible, vain, pretentious and avaricious. Although he claimed to have left his homeland in pursuit of greater intellectual and religious freedom, many believed he rather sought material gain. In 1622 de Dominis announced his decision to return to Rome. In letters to English ecclesiastical officials he explained that he considered the new pope, Gregory XV, a potential ally in the cause of religious reconciliation. Back in Rome in 1623 he published works claiming that he had found heresy to be rife in the Church of England and acknowledging errors he had made in his own writing and preaching. Once again, a number of his contemporaries felt that his decision to return was inspired by greed and personal ambition rather than his theological principles. Initially de Dominis was welcomed back into the fold, being granted absolution in May 1622 for his time as an Anglican. Unfortunately, the death of Gregory XV in 1623 left him with few powerful allies and he came once again under the eye of the Inquisition, which imprisoned him while his teachings were more closely examined. De Dominis died of a fever in prison in September 1624; shortly afterwards he was deemed by the Inquisition to have been a relapsed heretic and his body and his books were burnt. In life he was a man of many contradictions, but whether he was truly a brilliant theologian hindered by his unpleasant manner, or a cunning and greedy man whose luck eventually ran out, will probably never be clear.